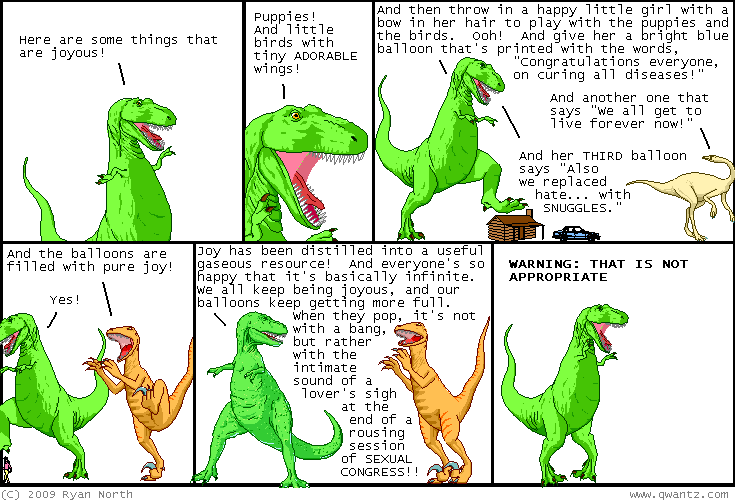 Dinosaur Comics - February 4th, 2009 - awesome fun times! February 4th, 2009: Andrew "MS Paint Adventures" Hussie has been putting together some videos with his friend Jan van den Hemel where they re-edit some Star Trek: TNG footage into hilarious short videos. They're great, you guys! I recommend watching them in order because it is comedy gold that builds on itself really nicely. Andrew Hussie is quickly becoming the only person whose house I park outside at night. I just want to watch him eat his dinner. Also, regarding my plagiarism comic from a few days ago, Steve sent me this great story from Southern Illinois University: SIU accused of copying plagiarism policy. Awesome.